Residents throughout the Fort Bend community are embracing their creative side through community art events! Check out some of the awesome works that have come out of these events. The Grand Mission neighborhood was severely impacted by flooding. During Harvey many of the residents needed rescues or assistance in evacuating. Texans Recovering Together planned an Art Event for residents to have an opportunity to express themselves and share their story. Many of these works have been submitted for display at the Harvey Experience. “Adults and children who attended made paintings or drawings, some wrote poems, and others made t-shirts in honor of what they went through during Hurricane Harvey. [There were] heartfelt conversations with each family that attended and we heard each of their stories and personal experience with the storm. A young boy had written two poems before he got to the event! One young girl (6 or 7 years old) in particular who drew a picture of her home, dirty flood water, her, her mom and her cat on a boat being rescued, thanked and hugged me for having put on the event. She even wrote out a short description of her painting which was inspiring. Attendees expressed how healing and relaxing it was to come and not only express themselves but also to share laughter and tears and have a meaningful conversation. [The Texans Recovering Together team] expressed their own sentiments about the event which was very positive – they were moved to tears by many of the stories and felt more convinced that artistic expression can be very healing. The Fort Bend Seniors of Rosenberg located at the Fort Bend County Community Center, created artwork based on Hurricane Harvey. 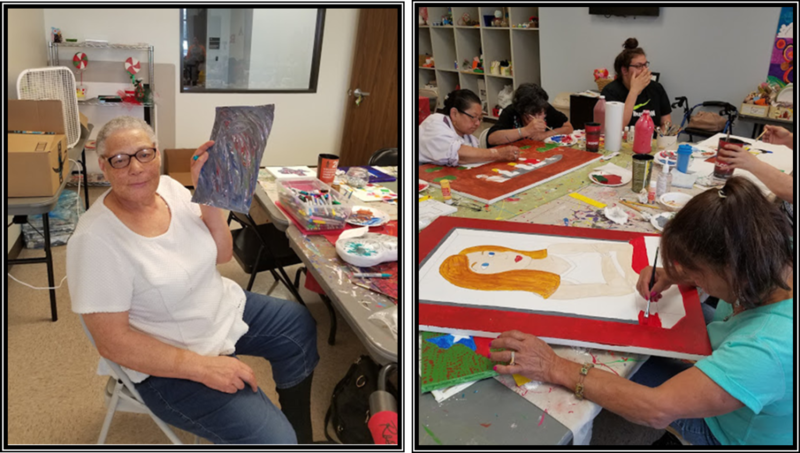 Their art teacher Jaime Hinrichs, who teaches at many of the Fort Bend Seniors locations, had them paint works that she had pre-dawn with their input. Though most of these had not been directly affected, they were very much a witness to all that happened in their communities. These artworks will be submitted for the event! Texans Recovering Together, Friends of North Richmond, and Attack Poverty hosted an art event for the Rosenberg community. Community members spent the day creating works of art that represented how Hurricane Harvey had impacted them. Many of them painted stones as a way of healing, using creativity to relieve their stress and as a medium to express themselves.